Over the years, I’ve had a couple of major influences on my artwork. If you’re an artist or musician, I’m sure you can relate. Maybe you had a “blue period” like Picasso, or you were obsessed with Joe Satriani’s riffs. That particular piece depicts a desolate nighttime landscape and floating bricks and a huge floating empty face and obscure personal references to heartache and lost love. The stuff of late adolescence, to be sure. It was definitely a “tortured poet” phase for me. 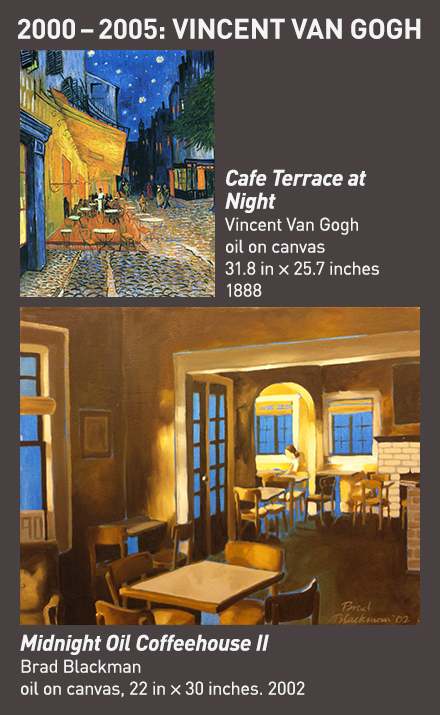 Later in college I started gravitating toward a blue-and-yellow palette, somewhat reminiscent of Van Gogh. I also painted a bunch of café scenes of the Midnight Oil coffee house just off campus where I went to college. I began toning nearly every canvas with bright blue or some other strong, bright color before painting it. Occasionally I still use this technique, but the blue and yellow scheme has evolved into a mostly blue and brown scheme now. I would intentionally leave pockets of bright color in between objects, where the canvas would “shine” through. Eventually I got tired of this and felt like a hack and stopped toning the canvas. 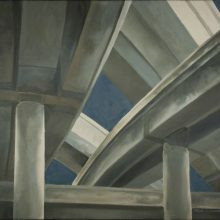 I started painting urban structures like highway overpasses, toning the canvases in bright colors. Eventually I got away from the bright toning, and adopted a grayer palette. I was really intrigued by Stephen Magsig’s daily paintings of urban structures in Detroit. So my work evolved into the Nashville365 series, which I got sick of and probably gave myself a huge creative injury trying to do. 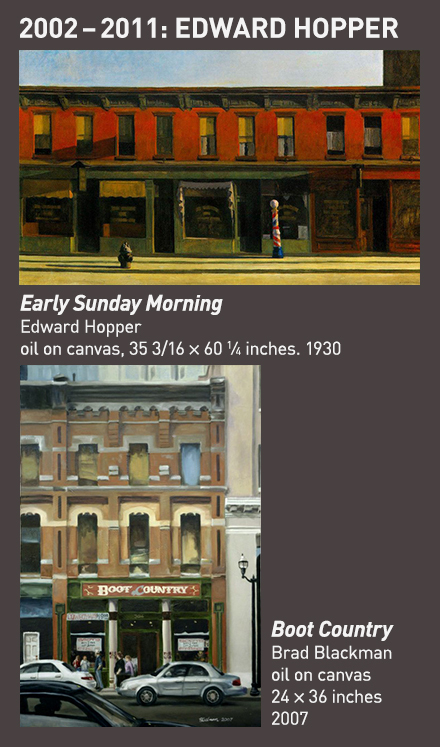 In doing so, I came to think of it as way too derivative of Edward Hopper, since Hopper did that 60 years ago. Hopper already did it, so why should I? I have to consider art history and what’s been done before. And that’s where I got stuck. I felt like I was retreading where Art had already gone, so why should I bother doing the same thing? Then for various personal reasons (like starting a family and an exhausting day job), I got away from painting due to my own stuckness and perceived lack of time. Then I guess I fell out of the habit of doing art on a regular basis. In 2011, I got an iPhone and immediately downloaded Instagram, an app that allows you to take and share photos. It has retro-inspired filters for your photos, and it makes sharing, commenting, and “liking” easy. Instagram reawakened a love for photography and image-making when I was mired in stuckness. It opened my eyes back up to seeing interesting things around me. So now, instead of creating research images with a bulky SLR, I whip out my phone and snap a photo. If it’s good, I can find a way to work it into a painting. That’s what happened with my last major work, “Melrose Interchange.” I took a bunch of photos with Hipstamatic, reworked them heavily in Photoshop, and used those printouts as reference for the painting. 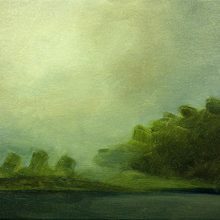 I’m also growing more interested in visual abstraction in the world around us, especially when things are obscured by clouds or fog. It makes me feel most peaceful and quiet. So lately when I do have the chance to get in the studio, that’s what I try to make, on small (but not tiny) canvases that I can make significant progress on in an evening. What artists have influenced you over the years? Can you point to anything specific during a particular time of your creative life? If so, I’d love to hear it in the comments. 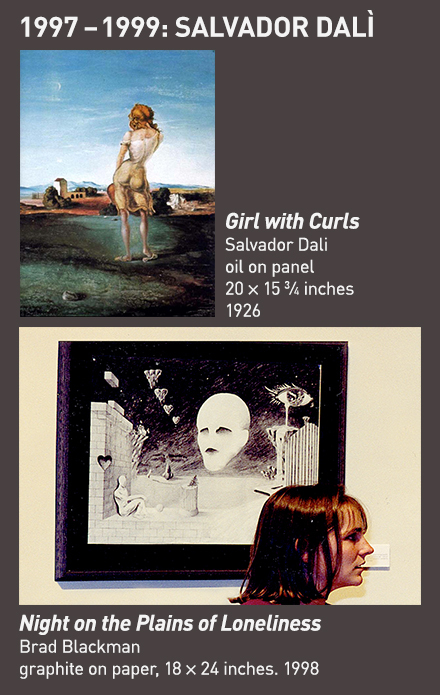 Girl with Curls Salvador Dali oil on panel, 20 × 15 3/4 inches. 1926.